Rafael Nadal’s prize after winning all 3 of his round-robin matches and Group Nastase is a match with clear world number 1 Novak Djokovic in the semi-finals Saturday. This matchup is historically very close with Nadal leading 23-22. However, it has become rather one-sided lately with Djokovic winning 7 of the last 8. So what can we look for going into tomorrow’s match? Here at Riles Clubhouse, we like to analyze tennis matches based on game performance, specifically how efficient a player is at holding serve and breaking his opponents serve. Likewise, we can analyze the head-to-head matchup with serve and return game statistics. 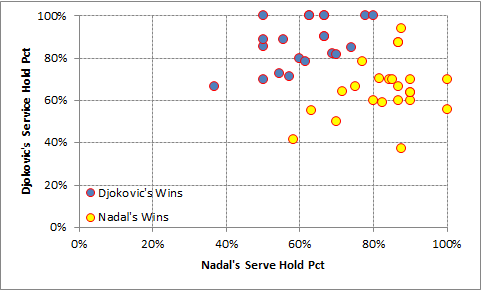 Below are the results of the service hold percentage for both Djokovic (y-axis) and Nadal (x-axis). There is clear differentiation between who wins the match based on the service hold percentages. Also, service breaks are common enough that in only 9 of the 45 was one server able to hold all of his service games throughout the match. Although informative, this analysis does not include the element of time. 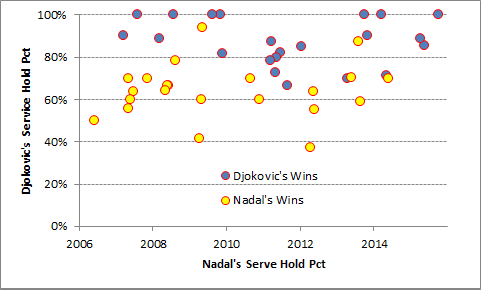 Below 2 charts show how Djokovic’s and Nadal’s service hold percentage trend with time. Djokovic’s hold percentage has very recently been very high and a good indicator of a win or loss. 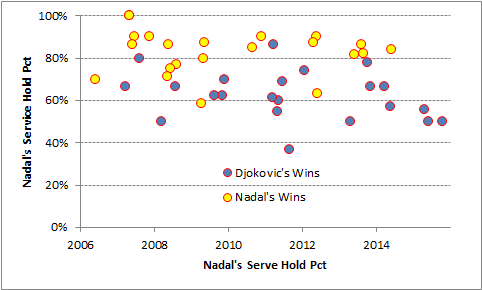 However, Nadal’s hold percentage has decayed against Djokovic drastically over the last 2 seasons. Now Nadal has only been holding serve against Djokovic around 50% of the time. Additionally, Nadal hasn’t won a match against Djokovic where his own service hold percentage was below 80% since the 2012 French Open final (which was on clay). Since tomorrow’s final is on an indoor hard court, an early telltale sign for Nadal will be if he can hold his own serve consistently. Djokovic has only loss 6 matches in the past year and in all of them his opponents service hold percentage was greater than 85%. Nadal’s best chance is to protect his serve. This is easier said than done against the player who has Riles Clubhouse highest return efficiency.